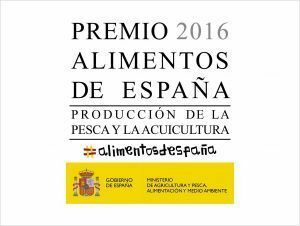 The Ministry of Agriculture and Fisheries, Food and Environment has conferred FRESCAMAR ALIMENTACIÓN, the company responsible for the breeding and commercialization of Corvina Rex Frescamar, with the award Alimentos de España 2016” (Spanish Food Awards 2016) in the Fishing and Aquaculture Production category. It is an acknowledgment of FRESCAMAR ALIMENTACIÓN background that rewards the company’s business trajectory, its socioeconomic relevance and the innovative nature of the company as well as its contribution to the promotion and improvement of aquaculture products’ image and their position in the market. One of the main reasons that motivated the deserving of such highest honor was the fact that FRESCAMAR ALIMENTACIÓN encouraged during the past year, among others, the launching of the first fish national brand originated into the private sector: Corvina Rex Frescamar. This milestone, beyond its commercial significance, has meant the recovery of a traditional Mediterranean species through aquaculture, enhancing its properties and increasing its value for distribution, catering and the final consumer. Aquaculture offers multiple guarantees for the final consumer and the catering industry due to the fact that this activity allows year-round availability and price stability and to the deed that aquaculture products are anisakis free.